Granite is an igneous rock that is usually light coloured with large grains visible in it. It is made up of quartz and feldspar with other minerals contained in it that give it a variety of colours. Red, grey and white are just a few colour options, with darker grains visible running through the rock. It’s often used for both interior and exterior objects, found everywhere from stair treads to monuments. The multitude of uses make it a popular choice for homeowners, particularly in kitchen and bathroom areas. Granite is the most well-known igneous rock because it is the most commonly found on the surface of Earth. Igneous rock is formed from solidified lava or magma, found inside the earth. Granite is a naturally occurring rock that can then be manufactured into a whole variety of different items. These can very easily be incorporated into the home. When granite cools slowly in the molten rock below the surface of the earth, the mineral crystals that make it unique are formed. This process takes a long time and the granite that’s found on the surface is only there because overlying sedimentary rocks have eroded away. Generally, it is found deep underground, beneath the earth’s outer crust. The rock is incredibly hard, making granite able to resist most abrasion. It’s also strong enough to hold considerable loads of weight. Although it can effectively withstand extreme weather, the rock can also be polished to a high shine, a benefit if using it as an interior material. It has been used for thousands of years as part of both interior design and for exterior uses such as paving, bridges and buildings. Being such a hard material makes granite incredibly useful for things like bathroom flooring, which can take a bit of a beating. The resistance to abrasion is a particular benefit for its use in kitchen worktops, as is its ability to withstand weathering. 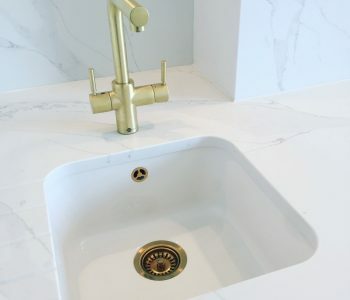 The changing temperatures of items placed on kitchen worktops means a hardy material is a must-have if it’s going to last longer than a few months. While wooden worktops may seem like a nice option, they are nowhere near as resilient as stone. There is an increased risk of scorch marks appearing if hot dishes are left on them, while laminate surfaces can look a little cheap, particularly after a few years. The different colours are naturally occurring so each house will have a slightly different design. 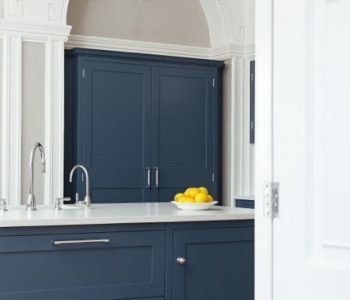 This makes granite worktops a truly unique choice for the interior design of a kitchen. There are varying qualities of granite so it’s important to opt for a high-end one. While it may cost a little more to start with, the length of time it lasts could work out cheaper in the long run. 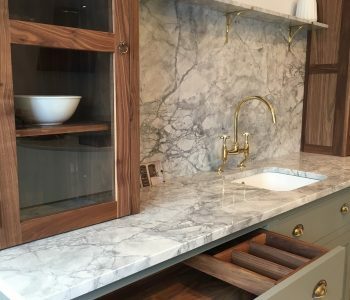 When it’s going to form such an integral part of the interior design, it’s important that it’s of a high quality and the different worktops are cut from the same piece of rock. If they are from separate sections, there could be a difference in the grain patterns, giving a slightly odd appearance. Generally, worktops will come as a set from the same batch of granite so this shouldn’t be an issue. While granite has naturally occurring colours, there are a range of different ones available. Generally, it is quite light in colour, but the darker mineral inclusions mean there are a variety of different hues available. There is the option of a red colour, or if more inclusions are preferred, it’s possible to get an almost black colour. After a good polish, the surface is smooth to the touch and gives a high-gloss effect that looks very chic in a modern kitchen. The granite can also be used in bathrooms, with a granite-topped vanity area or window sill. 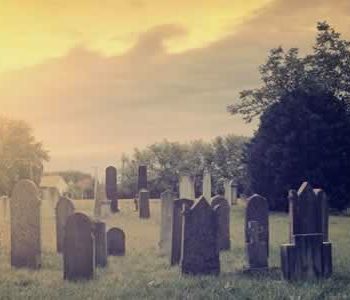 Again, stone is a more appropriate material than wood, as wood can have a tendency to absorb water and swell up or stain, looking unsightly. Granite can be incorporated into a wide range of different styles, looking as much at home in a rustic kitchen as an ultra-modern fitted one. 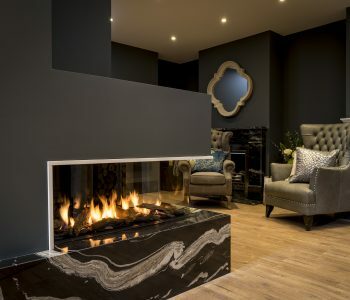 The colour of the granite can often be the key to getting the right look for a room so take the time to find one that complements the furniture and colour scheme of the room.